Alright gals, it’s time for the hearts, the glitter, the flowers, you guessed it – Galentine’s. We’re throwing a bash you don’t want to miss! Grab your best pals and join us in celebrating each other. This is a Free Event! Music, snacks, wine and shopping start at 7:00pm! Although it is a FREE event we will be taking cash and check donations for Pace Center for Girls. Pace provides girls and young women an opportunity for a better future through education, counseling, training and advocacy. 100% of the donations will be going to Pace center. They will have a table at the event so you can learn more about this awesome organization! Rhia Blackburn from Full Measure Pilates will be teaching a FREE 30-minute floor Pilates class at Fleet Feet Tallahassee! Pilates is first come, first serve until the floors are filled with mats!! If you don’t get a spot, don’t worry, you can sip, shop, and dance! Brooks rep and bra Guru will be there helping us with custom bra fittings and answering any questions or concerns you might have. Every lady who attends will receive a $15 voucher good for any Brooks bra. Bring a friend and we will double down - $30 voucher good for any Brooks bra. You will have time to sip and shop before and after Pilates. ****One lucky gal will win 1 FREE week of classes at the Refinery Barre Fitness Studio! Can you believe that? ****And it keeps getting better and better! 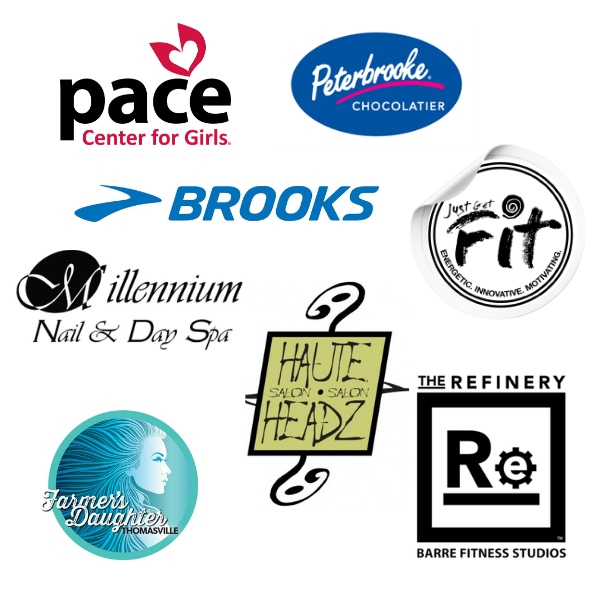 We will also raffle off a 1-hour massage from Just Get Fit (#mm35645), a $75 gift card to Haute Headz Salon! 2 tasting Cards to Farmer’s Daughter Vineyards , chocolates from Peterbrooke Chocolatier, a gift card for a pedicure at Millennium Nail & Day Spa and a top and bottom from lululemon AWESOME!! !